Are you sitting there looking at the year ahead and wondering how you will ever fit in the full homeschool curriculum you have planned? Are you wondering how you are going to stay sane and not burn out, let along succeed in homeschooling this year? Then, this article is for you! 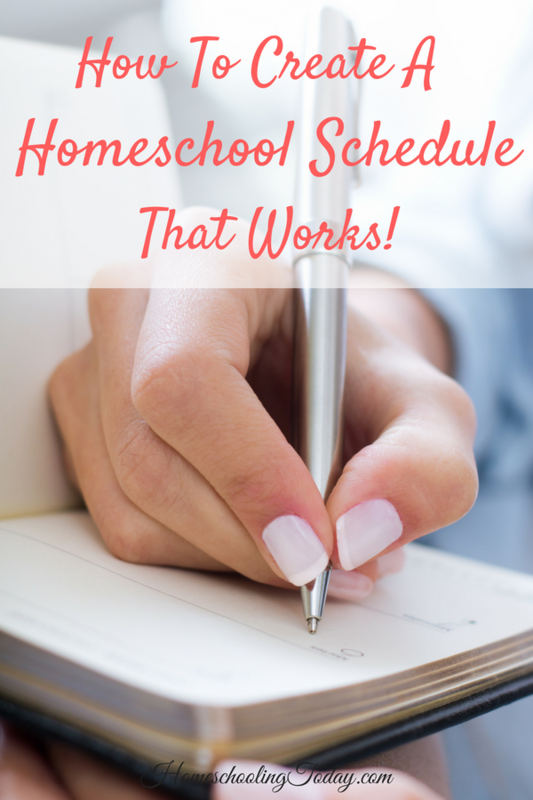 I am going to share a few ways you create a homeschool schedule that works. These tips are merely meant to be a guideline to help motivate you towards success in homeschool teaching this year. Use these tips to make a schedule that works for you and your family. Remove the idea that you must do specific topics on specific days and times; instead setup goals for your homeschool day. Each day have new goals of what you will work on, but remain open to the idea that you may have to adjust what topics you cover. Flexibility is necessary from you if the children are simply not in that mode during that specific time. Learn to adapt the homeschool curriculum as necessary day to day in order to meet the goals you have in mind, but also to work with your children’s moods and interests so that their desire to learn is strong. A great tool to have during your homeschool days is a timer. Whether you purchase a fun timer online, use a microwave timer, or a timer on your phone, it doesn’t matter. Make sure to have a timer that buzzes when time is up. This will help encourage your children to remain focused, and also hold you accountable to switch gears when necessary to meet your homeschool goals. A timer is a good way to teach children about time lapse as well. When children are not in the mindset to learn, they feel like time is dragging on and may complain about it. A timer will keep complaining at a minimum and learning at a maximum. As the mom and teacher, you know what the best time of day is to cover specific homeschool topics. If you know that your children are better at reading first thing in the morning, then organize your homeschool schedule in that way. If you find your child does math best after lunch, then schedule math at that time. Since you are homeschooling, you won’t necessarily have to do a 5-day curriculum. Try to adapt your homeschool days down to a four day school week. A four day school week can allow for a field trip day, and errands day, a housecleaning day, or a fun at home day. This can keep children motivated, help you get things done, and keep you all from burning out. There you have it – a few tips on how to create a homeschool schedule that works. The key is to remain flexible, learn to adapt, and set a shorter schedule based on the time of day that works best for your kids. You are in charge of your homeschool day. Learn to make it the most productive day possible by being in tune to what will work best for your children.